The One Trading Academy is a module-based learning programme which allows you to gain confidence and knowledge in trading the financial markets independently. The Academy is a free resource which can be provided on a one to one or group basis and is tailored for beginners and experienced traders. 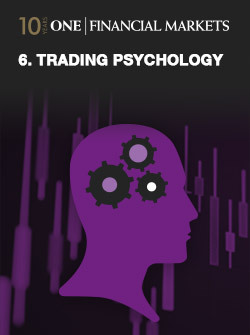 Work through our six online trading modules to develop your trading confidence. By the end of our trading academy you’ll be informed, enlightened and empowered to start trading for real. These different products are traded on what are known as Exchanges. One of the most well known exchanges for example is the NYSE(New York Stock Exchange). Next let’s move on to what is actually traded on the financial markets. A contract for difference (or CFD) is a contract between two parties; One Financial is the market maker in this situation and will be the buyer to anyone selling and the seller to anyone buying. The seller will pay to the buyer the difference between the current value of an asset and its value at contract time. (If the difference is negative, then the buyer pays the seller.) In effect CFDs are financial derivatives that allow investors to take advantage of prices moving up (long positions) or prices moving down (short positions) on underlying financial instruments and are often used to speculate on those markets. With CFDs you can benefit whether the price of an instrument is falling or rising. 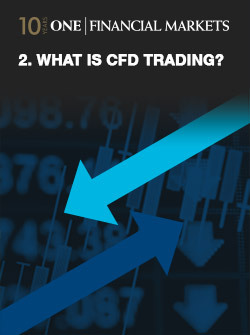 As we mentioned earlier there is no restriction on opening a position with a buy or a sell in CFD trading. Entering a position with a buy sell, which you would do if you thought the market was falling, is called short selling and allows you to sell a position first and then buy it back at a lower price. Whenever you buy a share, you have to pay the government 0.5% of the value of your trade. Well not with CFDs; unlike other investments there is no stamp duty to pay on a CFD trade. For example One Financial Markets offers a leverage of 400:1 on FX meaning that you could leverage a $2,500 deposit to trade $1 million! We will come on to some worked examples of margin and leveraging later on in our training. If you are a beginner then the most important thing is to manage your risk. 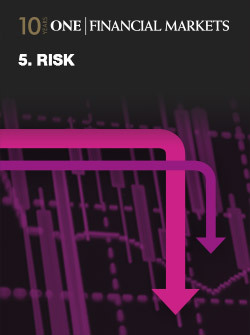 In fact managing your risk is so important that we’ve dedicated an entire module to explaining how to do it. When trading Bullion via a CFD, you don’t take delivery of Gold or Silver so the difference in the price between the buy and the sell price will be cash settled. Like pretty much all other investments and commodities, the price of Gold and Silver is driven by supply and demand. Given that most of the Gold and Silver ever mined still exists and can therefore potentially come back on to the market, it’s changes in sentiment more than changes in production or jewellery demand that will affect the price. There are also what is called specialised indices; these indices allow you to track the performance of a specific sector, but more often, the indices that will be offered are the broader indices that cover the main stocks in the market. A broad-based index represents the performance of a whole stock market and reflects investor sentiment on the state of the economy. Indices may sound like a confusing thing, but you’ve definitely come across them before; the most regularly quoted market indices are made up of the stocks of large companies listed on a nation's largest stock exchanges, such as the American Dow Jones Industrial Average and S&P 500 index, the British FTSE 100, the French CAC 40, the German DAX, the Japanese Nikkei 225 and the Hong Kong Hang Seng Index. Industrial Production: Output for key industrial sectors such as manufacturing, mining and utilities are highly sensitive to consumer demand and interest rates. This means Industrial Production is also key when forecasting economic performance and growth. In fact it’s so important that it’s even used by central banks to measure inflation because high levels of industrial production can lead to uncontrolled levels of consumption which then leads to inflation. Political factors are important. They’re interwoven with economic conditions for many investors when making investment decisions; and include things like the political and social stability in a country, government policies, regulatory environment and central bank intervention. You should also note that our prices may differ from the cash market that you will see quoted on Bloomberg, Reuters or any other reference source. This is because the cash price is calculated from a weighted addition of the prices of the constituent stocks. This can lead to a difference if a stock in an index is suspended or not trading correctly. One Financials price is therefore more accurate as it is a tradable instrument based on another traded instrument. The Foreign Exchange market (also commonly referred to as the FX, Forex or currency markets) is the single largest market in the world with an average of approximately $3.0 trillion worth of currency traded every day. The market exists whenever one currency is traded for another and consists of transactions between large banks, central banks, currency speculators, multinational corporations, governments and other financial markets and institutions. The FX market is an OTC (Over The Counter) market, in which participants trade via telephones and computer connections. One Financial Markets is one of the market makers that offer their own prices which are derived from various reputable counterparty feeds. We do not physically deliver currencies, but offer them on a contracts for difference basis, so that clients can speculate on the relative strength or weakness of a particular currency against another. Floating exchange rates are constantly changing and, like any other product, are influenced by the supply and demand for each currency. The factors that affect supply and demand can be generalised into 2 groups: Economic and Political. Economic conditions: If investors see opportunities to invest in a particular country, they will exchange their domestic currencies for the currency of that country, leading to the rise in the demand for the currency and hence the exchange rate. The elements that make international investors view conditions as favourable are complex and multifaceted, but include things such as GDP Growth, Inflation and taxation conditions. Political factors are interwoven with economic conditions for many investors when making investment decisions; and include things like the political and social stability in a country, government policies, regulatory environment and central bank intervention. Of these three market categories FX is probably the one you had in mind when you decided to learn a bit more about trading. 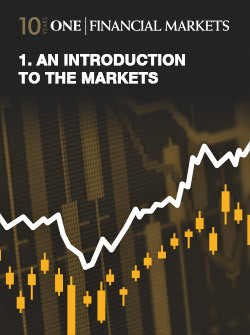 If you’re still not quite sure, or just want to know more about FX then take a look at the next module which is dedicated purely to the Foreign Exchange Market. At almost any point during the day there is always a financial centre somewhere in the world open for business. The FX market is open 24 hours a day and only closes at weekends between 22:00 (GMT) on Friday and 22:00 (GMT) on Sunday. We mentioned above that currencies are always traded in pairs; this is because when you buy one you’re essentially selling the other and vise versa. The bid price is the price at which the other party is willing to buy the base currency you want to sell in exchange of the quote currency. The ask price – if you want to BUY the base currency, then you would click on the ask price. The ask price is the price at which the other party is willing to sell the base currency to you in exchange for the quote currency. As long as you remember LONG = BUY and SHORT = SELL then you’re half way there. So a PIP is essentially the last decimal place of quotation, most currency pairs will have a PIP being equal to 0.0001 as they are usually quoted to 4 decimal places. This isn’t always the case however, as we can see from the example above. HOW MUCH IS A LOT.? One of the first concepts you need to understand as part of your Forex trading training are standard lots and micro lots; what are they and what’s the difference between them? 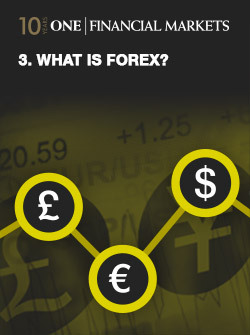 A standard forex lot is equal to 100,000 of the base currency so in the case of EUR/USD is EUR 100,000. The average pip size for a standard lot which is quoted to 4 decimal places is 10 of the counter currency, so in this case $10. If you are down 10 pips on a standard EUR/USD contract you have lost $100. Standard lots in forex are usually for institutional sized accounts; we're talking big rollers, who should have $25,000 or more to make trades using standard lots. Buying 1 lot of GBP/USD @ 1.31971 with a margin requirement of 3.33% will cost you $4,394.63. Now that you understand what a pip is and what a lot is, you need to know why you learnt about them in the first place. Technical analysis looks at past prices of an asset to predict future prices, and Fundamental Analysis believes that market movement is determined by macro and micro economic factors including interest rates, war, political unrest, recession, global economic depression etc. Fundamental Analysis helps us to measure an asset's intrinsic value. The idea behind fundamental analysis is that each asset has a “correct” price which means we can determine if the current market price is overvalued or undervalued. Keeping in mind that the price will always revert back to what is “correct”, knowing whether the asset is under or overvalued gives us an indication as to whether to buy or sell. Central banks make decisions that affect the economy, and decisions that affect the economy are decisions that will affect your trading so if you ever see any of these guys on TV listen closely to what they say, because odds are, it’s something pretty important. Understanding Interest rates is important when talking about factors such as the money supply or inflation because central banks use the manipulation of interest rates to control the money supply and combat inflation. This effectively makes borrowing money less easy and as a result the amount that people spend goes down. The decrease in expenditure means that the demand for many goods goes down, and as a result, their price will also decrease. This effectively allows us to borrow money more easily and as a result the amount that people spend goes up. The increased expenditure means that there is also an increase in the demand for many goods, and as the demand for these goods increases so too will their prices. I.e. your money is worth less, you can buy less with your buck [or pound or euro] and its all because of inflation. Cost-Push Inflation; this form of inflation occurs as a result of an increase in say the prices of wages and or of raw materials. These increased costs cause supply to decrease and consequently the amount of demand will outweigh supply. Again, where there is more demand than there is supply, prices increase = inflation. This data/news can have both a short and long term impact on prices and traders will look to benefit from any movement created by these economic data releases. So investors will make investment decisions based on their interpretation of the economic data which has been released. The strength of importance of the data will also be a factor in determining strength of price moves. In this case, higher than expected unemployment rates is bad news, so there was an initial sell off on the Dollar. It’s a common misconception that all there is to technical analysis is lots of charts. 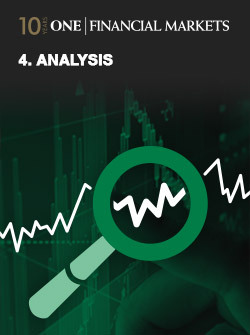 There are plenty of skills involved in technical analysis which if applied, and applied correctly, are able to increase the probability of a winning trade by predicting the likely price action. Support and resistance is a concept used within technical analysis that suggests that the market price of an asset will tend to fall and rise at certain predetermined levels. The support level is the level at which the price tends to find support as It is falling; it is more likely to “bounce” off this point rather than break through it. In the event that a price does in fact break through its support it will often continue to fall until a new support level is identified. When the market moves up and then pulls back again the highest point before the fall was be identified as the price resistance level. Similarly as the market then moves up again, the lowest point reached before the increase began is the support level. Unfortunately it’s not as easy as A, B, C - support and resistance levels aren’t exact numbers that can be worked out using a formula or rule. A support or resistance level may appear to have broken but soon after we see that the market was just testing it and the support and resistance levels remain in place. The fact that support and resistance levels are often depicted as lines, when they are not in fact exact figures is sometimes misleading – so it’s often simpler to think of support and resistance as zones as opposed to definitive levels. 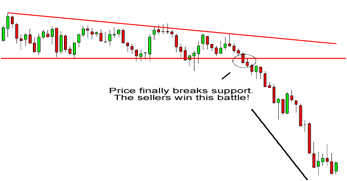 A price can move up for example, breaking the minor resistance in order to test the major resistance and as we can see below often a price move against the trend will be stopped by the minor resistance or support, and reverse. If you plotted a 10 period simple moving average on a 1 hour chart, you would add up the closing prices for the last 10 hours, and then divide that number by 10. There you have a simple moving average. EMAs place more weight on the most recent periods and react faster to recent prices than SMAs. The shorter the EMA period the higher the weight that the current price will carry in the MA curve – the opposite is also true. SMAs are better when you are looking at a more long term and general movement of the market. It is best applied to trends over longer periods of time and avoids the misleading price spikes encountered when using EMAs. Although beneficial when taking a long term view, the slow reaction experienced when using SMAs causes a price lag which can make short term movements harder to take advantage of. Now that we have compared the two, it’s really up to you to decide which you would like to use. Take into consideration whether you are looking to gauge a long term trend, or looking to take advantage of a short term movement. If you’re ever in doubt which to use, there’s no harm in using both; EMA to get a general idea of the overall trend, and SMA to take advantage of short term movements. 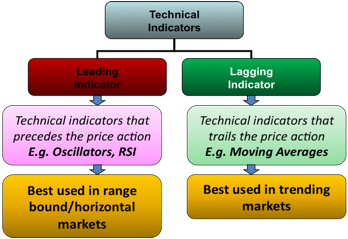 Moving averages are often used to identify trends as displayed in the graph above. When the price of the product is higher than that of the moving average then the price can be said to be in an uptrend. For example many traders will only consider going long when the price is trading above a moving average. In this graph an upward momentum can be seen in instances where the shorter-term averages are located above longer-term averages. In cases where the price falls below an important moving average it can then act as a resistance level which traders often use as a sign to take profits or to close out any existing long positions. As we discussed previously moving averages can be used to define up and downtrends. Moving averages can also therefore be used as a signal to buy or sell. The most common type of crossover is when the price moves from one side of a moving average and closes on the other – this can be seen on the graph below. 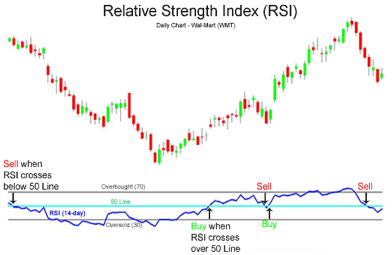 The Relative Strength Index [RSI] determines the speed and change of price movements; it allows traders to measure the buying or selling momentum of a product. 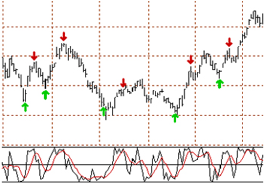 RSI oscillates between 0 and 100 and generally a market is thought to be overbought once the RSI approaches 70. This is a good indication that the asset may be getting overvalued and is a good candidate for a pullback. Conversely in instances where the RSI approaches 30, it is an indication the market may be oversold and therefore the asset is likely to become undervalued. In technical analysis, overbought is a situation in which the price of a market has risen to such a degree - usually on high volume - that an oscillator, for example an RSI, has reached its upper bound. Generally when a product is overbought it is an indication that the market is becoming overvalued and may experience a pullback. Hopefully it is now more clear to you what it means to say an asset is overbought or oversold, but please remember that determining the degree in which an asset is overbought or oversold is very subjective and can differ between traders. Stochastic Oscillator is another example of a leading indicator; it is a momentum indicator that measures the speed of change of price or the impulse of price. It does this by comparing an asset’s closing price against its price range over a given time period. Bollinger bands is an analytical tool used by traders to identify a market’s volatility and looks at the levels of current prices relative to previous trades. We can see from the above graph that in an instance where there is little volatility the bands contract and as the market becomes increasingly volatile the bands expand. Often what is seen with Bollinger bands is that as the price deviates within the band it often tends to return back to a middle ground; this is what is known as the Bollinger Bounce. It is not an often occurrence to see a Bollinger squeeze; when looking at a 15 minute candlestick chart it will be experienced only a couple of times a week. 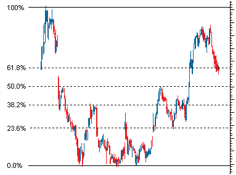 Fibonacci retracement works by taking two extreme points on a chart and dividing the vertical distance between the two points by what are known as the Fibonacci ratios. These ratios are 23.6%, 38.2%, 50%, 61.8% and 100% and the quotient of adjacent numbers in the sequence. Once these calculations have been done and the point defined they are noted on the graph using horizontal lines. These lines are interpreted by many traders as levels of support and resistance and are also used to help identify strategic places for transactions to be placed, and target prices or stop losses to be selected. In the below example of a systematic triangle the market is making lower highs and higher lows. This type of price activity is called consolidation. Finally there are descending triangles; Descending triangles are essentially the opposite of ascending triangles. We can see in the diagram above that having bounced off the support level slightly the price then returns to re-test the support again. If the price is unable to break through the support level for a second time and is seen to bounce off of that level again, a DOUBLE top chart pattern has been formed. 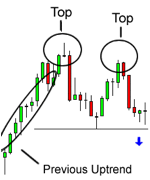 When using double tops as a form of analysis traders will often look to go short below the level which is referred to as the “neck line”. When the price level falls below the neckline traders will expect the reversal of an upward trend. Head and Shoulders is formed by a peak, known as the “shoulder” which is then followed by another higher peak, the “head”. Following on from this high peak [head] another shoulder is seen depicting a lower peak. Finally we can see that there is a neckline which is drawn by connecting the lowest points of the two troughs. Although in this case the neckline is a straight line it can be either upwards or downwards sloping. 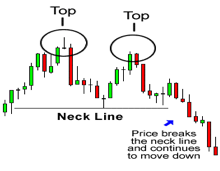 Much the same as double bottom and top formations traders using head and shoulders will also look to sell once the price falls just below the neckline as it is thought to imply an impending downward trend. A reverse head and shoulders is pretty self explanatory; it’s a head and shoulders formation, in reverse. 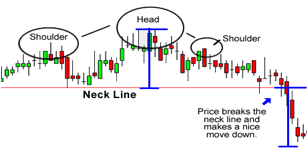 An inverse head and shoulders formation is a bullish reversal pattern and so traders will look to buy when the price increases above the neck line as they will be expecting an upward trend break through. We can see above that the body of the spinning top is small despite there possibly being a large amount of price fluctuation during the day. It is also either green or red in colour, indicating an upward or downward sentiment. Traders use the presence of a spinning top to predict whether there is an impending up or downward trend. For example if after a long uptrend a spinning top forms this generally means that buyers have begun to lose interest and it is indicative of an impending downtrend. The opposite is also true. Marubozu pattern at first glance looks very similar to the spinning top candlectick formation described above. The main differences between the two are that the marubozu are larger in size and unlike spinning tops do not have shadows. Again the two colours, green and red, indicate whether the market is bullish or bearish. We can see for example in a bullish market that the open price = low price and that the high price = close price. 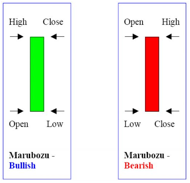 The green marubozu pattern is often seen as the first part of a bullish continuation or a bullish reversal pattern and so may traders will buy into a market in which they see a bullish marubozu. The opposite here is the bearish marubozu which is seen in red. In this case the low price = close price and open price = high price. A bearish marubozu implies an impending bearish reversal or a bearish continuation and so many traders use the red marubozu as an indication to sell into the market. First let us look at the long-legged Doji – here we can see that opening and closing prices were essentially equal. This long legged Doji implies that there is almost equilibrium between supply and demand and that there may be a turning point in the prices direction approaching. Next there is the dragonfly Doji – similar to the long-legged Doji the dragonfly Doji also forms when an assets opening and closing prices are equal. The long bottom shadow however means that this equilibrium took place at the high of the day. Again it implies that the direction of the trend is nearing a major breakthrough with the longer lower shadow implying the possible reversal of a bearish trend. Finally a four price Doji is a candlestick formation where the day’s high, low, open and close price were all equal. 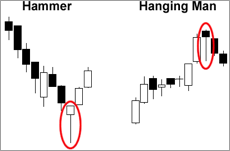 This is the most neutral of all the Doji candlestick formations and does not occur often. It is seen mostly in times where there is a very low volume of trading such as after hours and is often disregarded by traders as being a result of bad data. 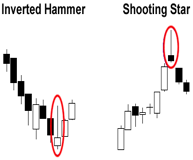 The hammer, which can be seen above on the left in green, is a bullish reversal pattern that forms during a downtrend. When prices are falling hammers signal that the support level has been approached and prices may well begin to rise again. Traders often take a hammer man as in indication of an impending price rise, but it is always safer to wait a while and confirm a bullish trend before buying. The inverted hammer occurs when a falling price indicates the possibility of a reversal. Its long upper shadow as seen below showing us that buyers are attempting to counter the downwards pressure and were able to close the session near its open as opposed allowing the price to be pushed down further. Its shape indicates that the price opened at its low, rallied, but pulled back to the bottom. Conversely to the inverted hammer the shooting star shows us that sellers countered the upward pressure of buyers and were able to keep the day’s close almost equal to its open and avoid any further upward pressure. We’re finally done analysing; and now that you know the basics of both technical and fundamental analysis it’s up to you to put your newly learnt skills to use. It depends on your trading style, your objectives, your time frame and many other factors. Don’t put yourself in a box and stick to one style, there’s value in diversity.You can use any or all of these different methods as each complements the other. Many investors use technical analysis and graphing to decide on strategic exit and entry points, but use fundamental analysis to decide which asset to trade on. There’s limitless combinations, and limitless opportunity – good luck with your trading! So now that we know what risk is, what exactly is risk in terms of finance? If trading the financial markets is effectively the trading of risk, then why would we “risk” the market going against us? Low risk investments will have lower return potential than high risk investments. Using a stop loss – a present level at which an open trade is automatically closed – is standard good practice as this can limit your downside risk and also shows trading discipline which is paramount in developing a healthy trading account. However, when markets are incredibly volatile you could experience some slippage with the position not being able to be executed at the exact level specified. In volatile markets there is often a “gap”, where a product moves substantially lower or higher than expected perhaps as much as 10-15%. With a normal stop loss you will get the first available price which could cause a large loss and result in a loss greater than your initial deposit. A general rule of thumb is that no single trading position should amount to risk exposure of more than 5% of your available capital. However in volatile market conditions this kind of leverage is dangerous as any loses will magnified by even more than normal. Volatile markets are associated with high volumes of trading, which may cause delays in execution. While online trading normally means you place a trade at a current bid and offer you see, some market maker may widen bid offer spreads or even temporarily withdraw tradable prices. This means that execution can be delayed and prices to execute at may not be available. One Financial provides fixed spreads no matter what market conditions but in times of increased volatility it is sometime better to limit trade execution.